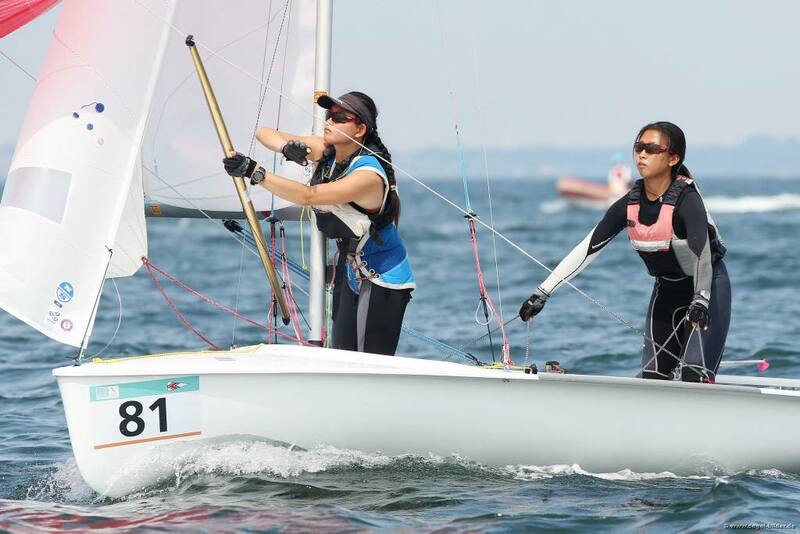 Top performance of the day goes to Singapore’s Kimberly Lim/Savannah Siew who knocked out back to back race wins from the two races, in a fleet containing some of their closest rivals and leap to the front of the 420 Ladies leaderboard. No wonder the pair were honoured as Singapore’s National Sports Team of the Year just a few months back. Some new faces at the front of the fleet in today’s two races in the 111 boat 420 Open fleet. The strength of talent is enormous and so far only one team has managed to finish in the top three for more than one race –series leaders Adrian Dominguez/Calixto Abalo (ESP). It is an understatement to say that the world’s best 420 sailors are competing – it is a fact. “We didn’t expect to do so well,“ explained Abalo. “We are going quite fast and we think we can do it, but the Championship is long so we will see.” The team who have been together three years, rank their top performance as winning the under 19 category at the Spanish Nationals last year. The blue fleet started first at 1305 hours, with the Greek pair of Aggelos Arvanitis/Theofanis Kanakaris making it look easy as they controlled the fleet from start to finish. All change in race 4 though, as they finished outside the top ten and then added a discretionary penalty to their scoreline, but they still hold firm inside the top ten at eighth overall. 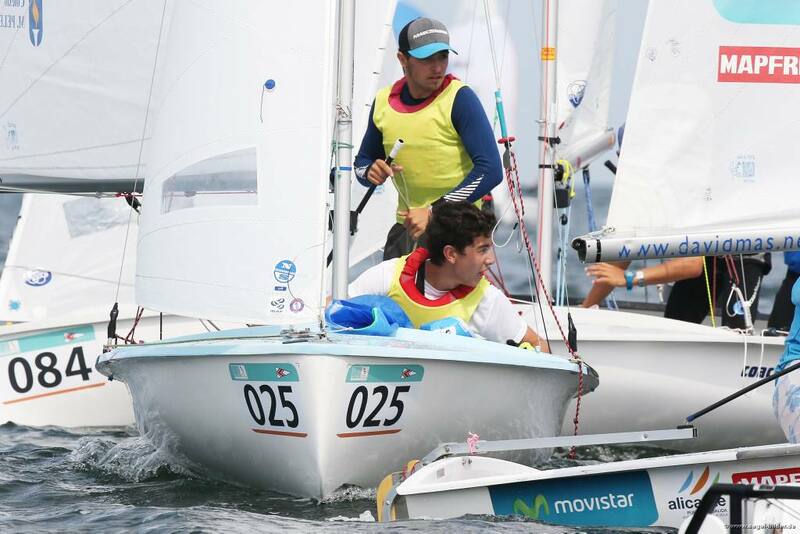 New Zealand’s Sam Barnett/Zak Merton took over the front of the fleet in race 4, chased hard by Diogo Periera/Manuel Macedo (POR) and Augustin Romero/Fermin Jacobs (ARG). Their winning result helped propel the Kiwis from 61st going into the day to 34th by the end, nicely inside the gold fleet 56 boat cut. 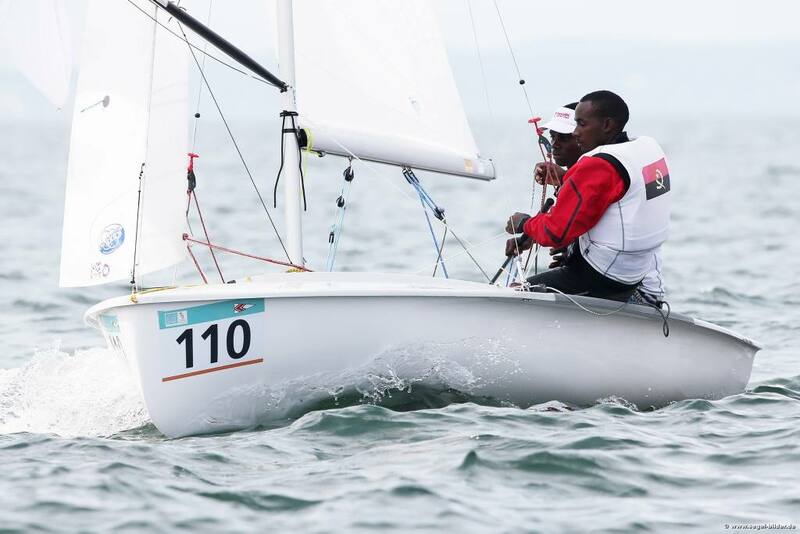 The yellow fleet started after the blue fleet, with Wiley Rogers/Ian Robinson (USA) taking the early lead up the windward leg in race 3, pushed by Malaysia’s Muhamad Faizal Norizan/Ahmad Syukri Abdul Aziz, silver medallists at the ISAF Youth Worlds, and Israel’s Ido Bilik/Ofek Shalgi. Down to the gate of the inner loop course, and it was all change with Robin Follin/Tao Manni (FRA) finding the puffs and the pace to move to the front of the pack, chased by Bilik/Shaigi with the two holding firm in the same order to the finish. 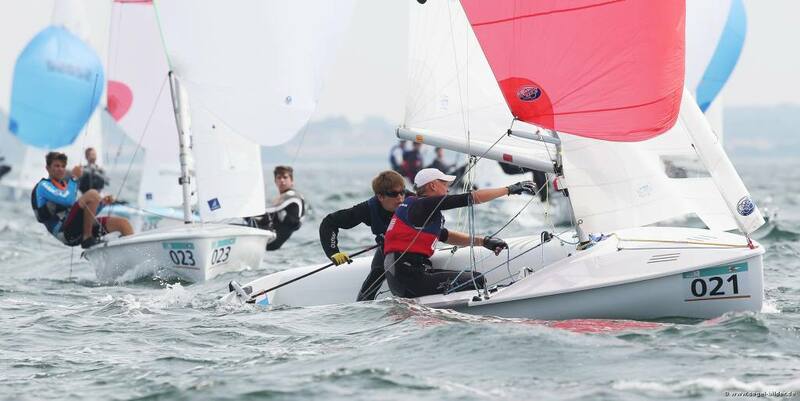 Wise insight after racing today from the USA’s Jack Parkin/Florian Eenkema Van Dijk who are a perfect example of the depth of quality in the fleet, as they bounce around on a scoreline of 27, a win, and a 26, 19 in races 3 and 4, to end day two in 27th overall. With a slightly different order, the same teams hold firm in the top 10 after today’s races, with the exception of Israel’s Nitai Hasson/Yoav Shpilman who move up to tenth from their 8,12 scoreline today. 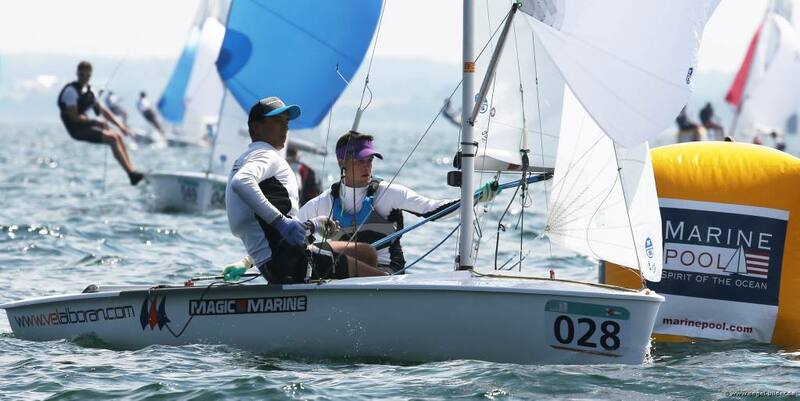 Singapore’s Lim is thrilled to be racing against rival Mas so early in the qualifying series, particularly as their friendship goes back long before the 420 to Optimist days. 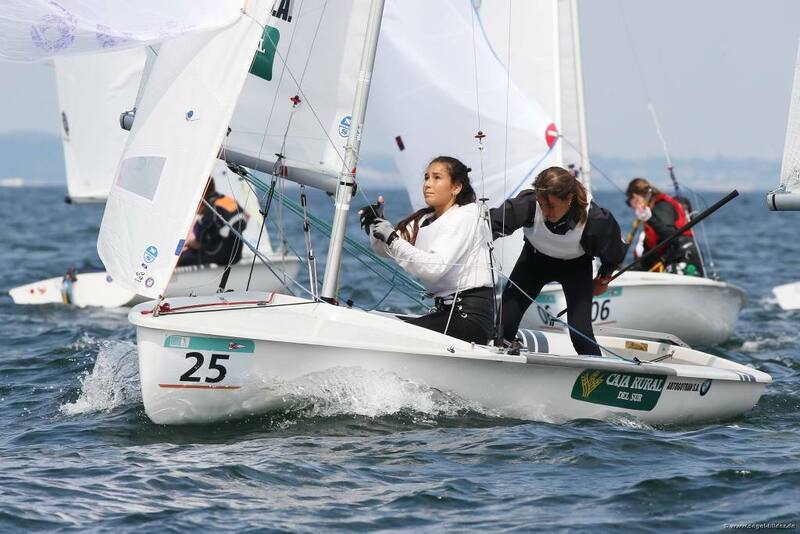 “We have been really close to the Spanish girls over the past couple of years,” said Lim, who won the 2011 Optimist World Championships. A procession behind the Singapore team, as Italy’s Carlotta Omari/Francesca Russo Cirillo finished in 2nd place in each race and Spain’s Silvia Mas/Marta Davis claimed two third places. Asian prowess continues in the leadearboard top 10, with Malaysia’s Nuraisyah Jamil/Umi Nurwahida Sallehuddin moving up to 6th overall from their 7,2 results. Early days, but don’t miss the four Spanish teams in the top ten which is testament to the nation’s pedigree in the 420 and, combined with Spain’s resuts in the 420 Open, currently puts them well on target to retain the Francis Mouvet Trophy as top overall nation, which they won in 2013 and 2012. Australia, Austria, Brazil, France, Great Britain, Germany, Greece, India, Ireland, Israel, Italy, Japan, Korea, Malaysia, New Zealand, Portugal, Singapore, Spain, Switzerland, Turkey, USA. Just two more races tomorrow to complete the qualifying series and for teams to make the cut to the gold and silver fleets for the final 6 races series. After race 5, the single discard comes in, so expect massive shuffling on the leaderboard as teams discount their worst result. A reserve day is scheduled on Thursday, ahead of the final series getting underway on Friday 1 August 2014. 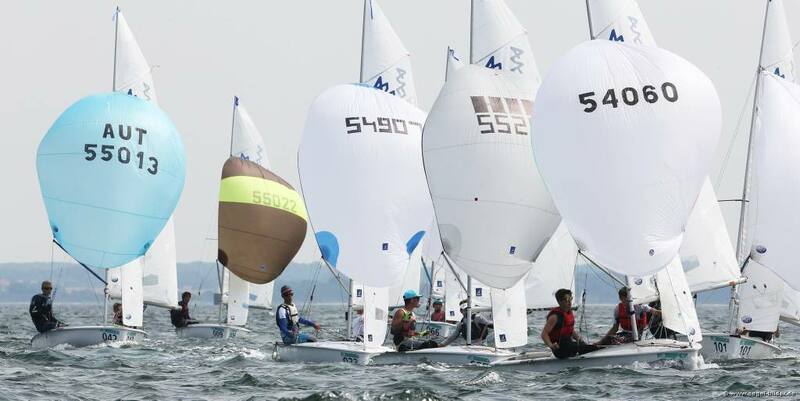 Restricted entry quotas heighten the national rivalry to even qualify to the 420 Worlds, as each nation is only permitted seven entries in the each of the 420 Open and 420 Ladies events. The only exceptions are for host nation, Germany, with fourteen entries and a spot is reserved for the defending World Champions, which in the 420 Open are Xavier Antich/Pedro Terrones from Spain. Racing for the 420 Open and 420 Ladies is scheduled to start at 1300 hours with 2 races for each fleet. 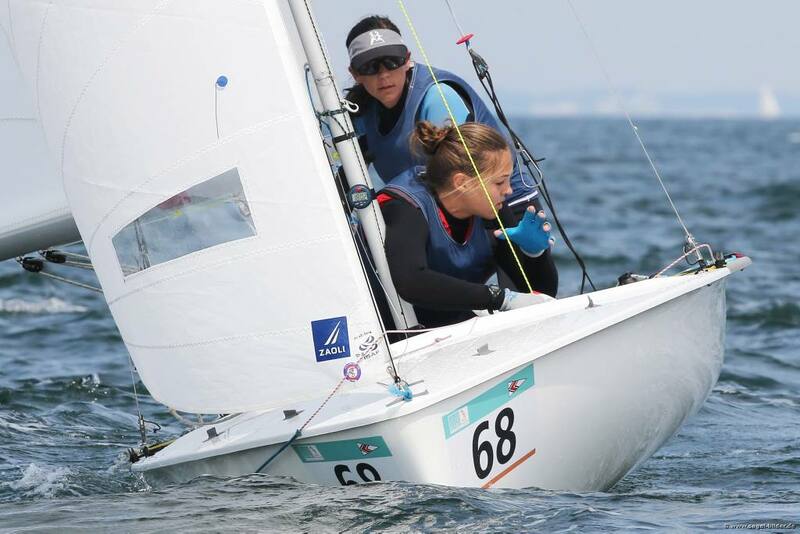 Visit worlds.420sailing.org for daily press release, race updates and photos. Christian Beeck is the Official Championship Photographer. Images will be published on the Championship Website and the International 420 Class Association Facebook page. 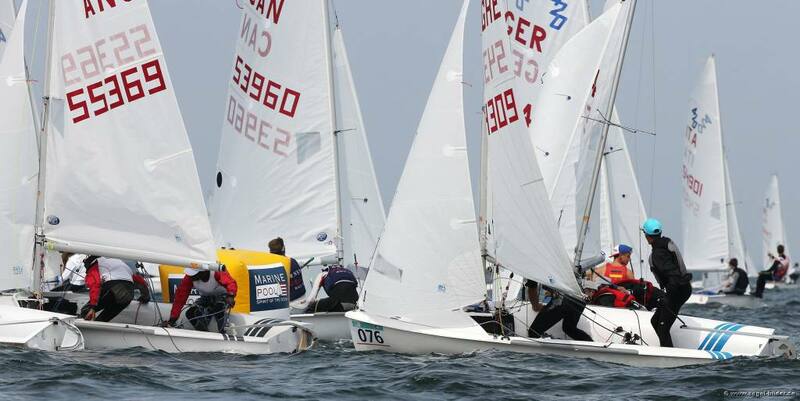 The 2014 420 World and Ladies World Championships, 25 July-3 August 2014, is being held on the Priwall Peninsula off Travemuende and is organized by the Lübeck Yacht Club in partnership with the German 420 Class Association, Deutscher Segler Verband and the International 420 Class Association. 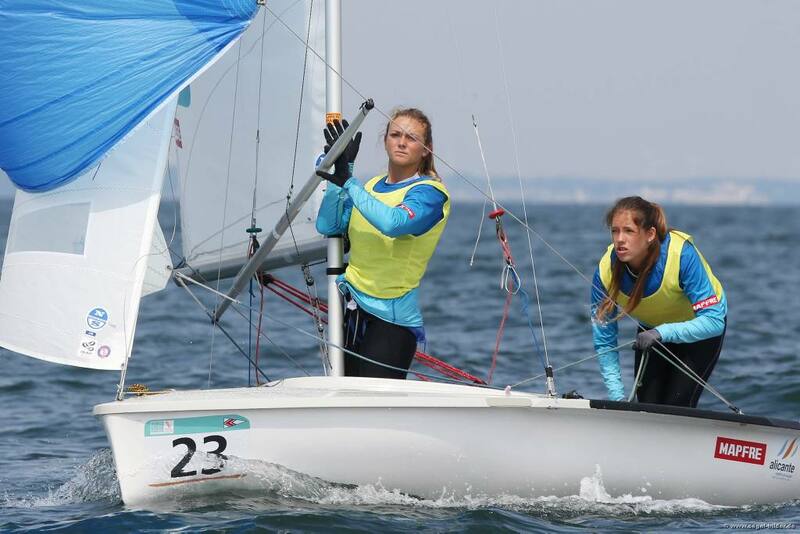 ISAF Youth World Gold Medallists Silvia Mas/Marta Davis from Spain asserted their authority on race day 1, but today it was all change as rivals Kimberly Lim/Savannah Siew (SIN) took over the race track and won races 3 and 4 in defining style. The 420 Ladies yellow fleet fielded some of the closest matched teams as the top three in the yellow fleet find themselves dominating the overall leaderboard. 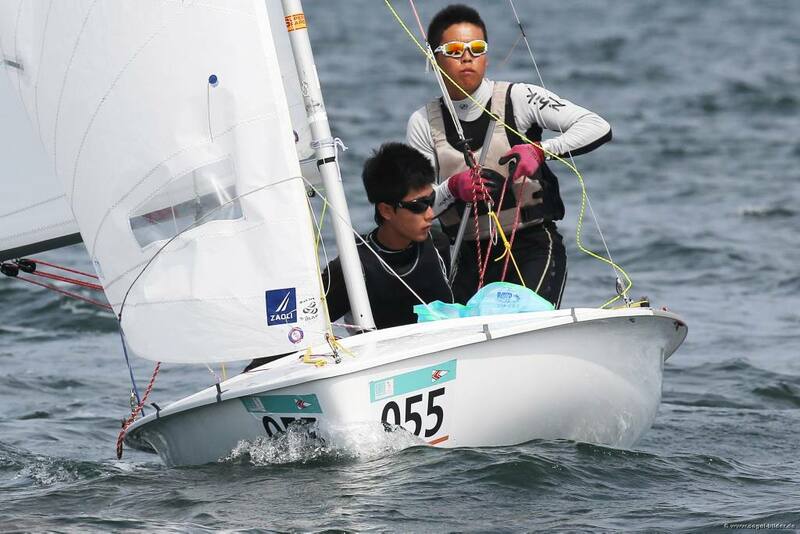 Singapore’s Lim is thrilled to be racing against rival Mas in the qualifying series, particularly as their friendship goes back long before the 420 to Optimist days. A repeat procession behind the Singapore team, as Italy’s Carlotta Omari/Francesca Russo Cirillo finished in 2nd place in each race and Spain’s Silvia Mas/Marta Davis claimed two third places. 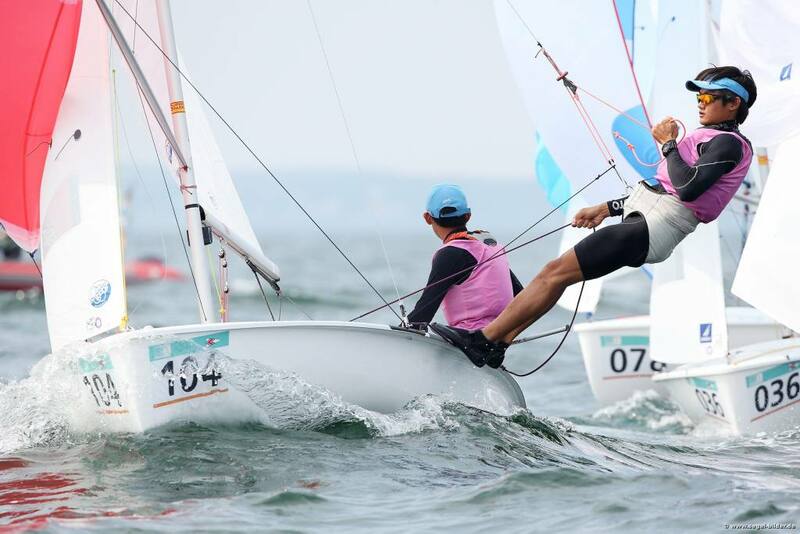 Asian prowess continues at the front of the fleet, with Malaysia’s Nuraisyah Jamil/Umi Nurwahida Sallehuddin moving up to 6th overall from their 7,2 results. Early days, but don’t miss the four Spanish teams in the top ten which is testament to the nation’s pedigree in the 420 and puts them well on target to retain the Francis Mouvet Trophy as top overall nation.